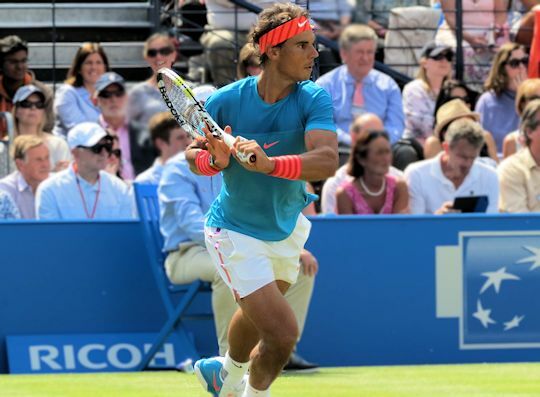 For those of us in the UK, it was great to see Rafa back at Queen's this week even though he wasn't there for long. 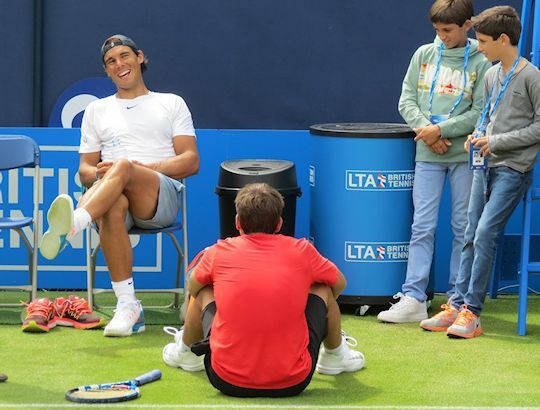 Some of us rushed up on Monday in the hope of seeing a practice session and we were rewarded by two hours standing watching him across two courts. 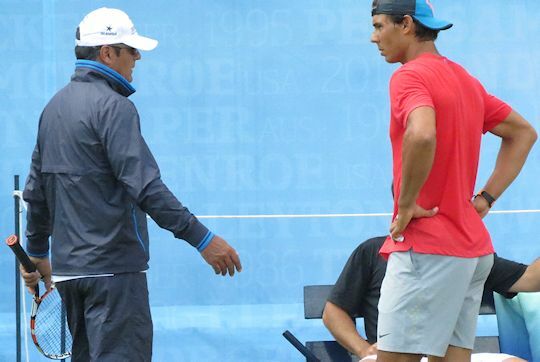 Last time he was here, in 2011, he was supported by Francisco Roig but this time it was his Uncle Toni who provided the coaching. 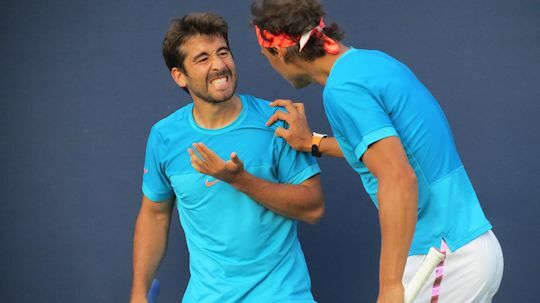 He was as focused as ever but also relaxed and happy in Marc Lopez's company. 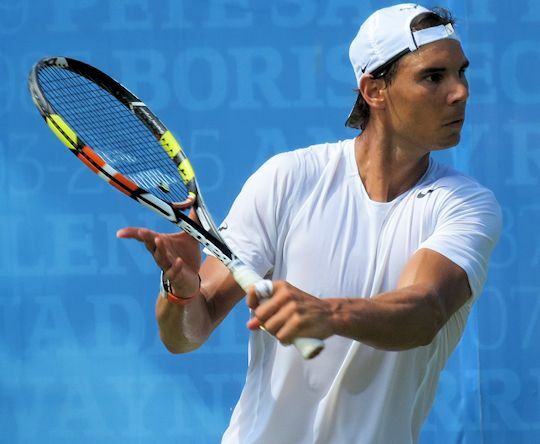 The next day was a bit of a stormer with Rafa playing both singles and doubles. Luckily, the weather was kind so there was a very good chance that both matches would be played. His warm-up was early and relatively short. I wasn't expecting him to win the tournament but it was still rather upsetting to witness him lose in the first round to Alexandr Dolgopolov, 3-6, 7-6(6), 4-6. Here's a gratuitous shirtless pic by way of compensation. 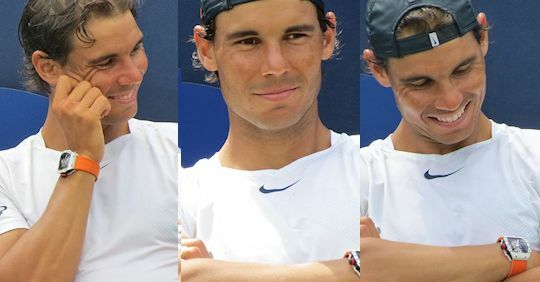 It was good that we still had the doubles to watch and even better to see this lovely smile from Rafa when he first came on court. They beat Milos Raonic and Edouard Roger-Vasselin, 6-4, 6-4, despite Marc's unfortunate altercation with one of the fencepoles at the side of the court. 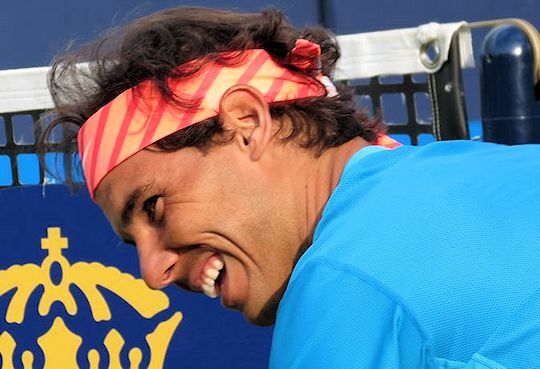 This is him showing Rafa he still has all his teeth. It was a lovely match to watch and balm to our souls. 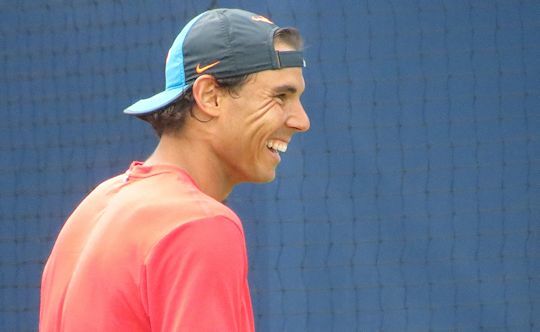 Since he was still in the doubles and had no matches scheduled that day, he practised for two hours on Wednesday. It was very relaxed (for Rafa and for us, since we were seated for this one). Even Toni's children were there. Our vantage point in the front row afforded a good view of Rafa's smiles. They lost the next day in the doubles to the number 3 seeds, Daniel Nestor and Leander Paes, 6-7(3), 4-6. In hindsight, I don't expect they were too bothered since, if they'd won, they would have had to sit through a day of rain and then play their next match on the last day of the tournament. 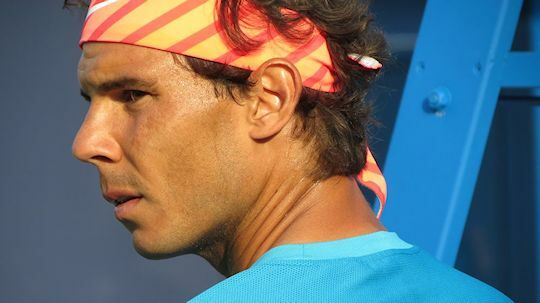 Hope to see you back here next year, Rafa.